Don’t wait until your burnt out. Too often carers become so involved in taking care of those around them that they forget to take care of themselves. It is important to notice when your own health and well being is at risk and to seek support. 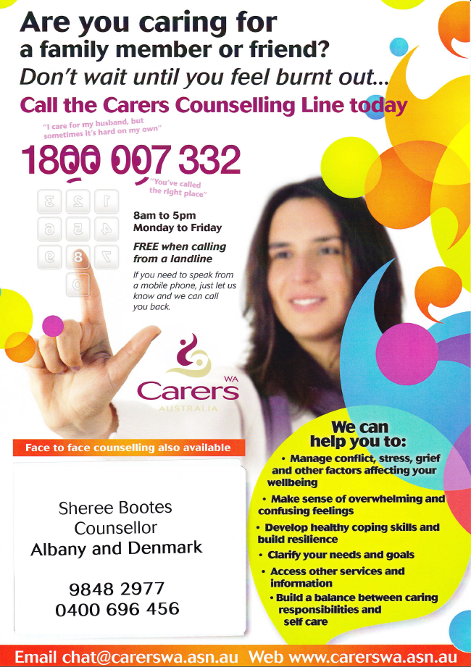 Counselling can be helpful to make sense of the overwhelming and confusing feelings often experienced by carers. Additionally, accessing this support with Sheree at Reconnect Health and Wellbeing will provide you with the opportunity to take care of you by developing some healthy and nourishing coping skills. The counselling is funded by CarersWA and can be accessed simply by contacting me on the details available on my website so you can achieve a helpful balance between caring responsibilities and self care! ← Depression and Anxiety in Rural Australia?